The term ‘socialisation’ is one that we hear about a lot and have heard about for many years, but what does it mean? According to many it is about getting your puppy ‘out there’ and meeting as many people and dogs as you possibly can – along with other things such as livestock etc. Socialisation however can be a real minefield. A few months ago, I went off to see Bob Speakman and his family with their pet dog, Bailey a black Labrador Retriever. The family had decided to get a dog and felt that a Labrador would be the most suitable. Generally they are known to be good with children and although Bailey was to be primarily a family pet and companion, Bob also wanted to use him as a Gundog. So much so, that Bob did a great deal of research into dogs and the Gundog breeds in particular before deciding on a breed and a breeder of a suitable dog. The Speakman children were fantastic in understanding that tug of war and fetch were not allowed with their playmate and were encouraged not to wind Bailey up too much when playing with him in order that this did not conflict with his Gundog training later on. Unfortunately, this did lead to them not playing with him much at all, as they were unsure how to so without ‘doing the wrong thing’. 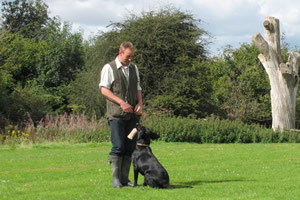 Bob was quite focussed on Bailey’s training and had done much reading in regard to raising and training a working Gundog. Because Bailey was the Speakman’s first dog, they immediately took Bailey to puppy classes, they were especially keen to allow him to socialise with other dogs and people so that he was friendly and well mannered pet. Bailey was not only allowed, but encouraged to run free with all the other puppies in the class by the trainers at the puppy school. Bob contacted me when he was somewhat near the end of his tether. The problem that the family were experiencing with their (by this time) 14 month old Labrador is that he was friendly – very friendly. In fact, he became so excited around other dogs/horses and livestock (both on /off the lead) that Bob had started to walk him in virtual isolation – where he would probably meet no one in order that he maintain his sanity and Bailey’s safety! If he did meet other dog walkers or bumped in to animals / horses etc , he would have to be very quick to get the lead on or Bailey would be off…ignoring all commands and be gone – going bonkers with excitement at the prospect of new friends. This has happened with horse riders and was no fun at all for Bob; in fact, it was most dangerous for all. Bailey would ignore Bob completely despite his frantic calling and grabbing and trying to ‘tackle’ Bailey until he was quite finished with what he was doing and then the tired dog would return with glee. Bob informed me that he did have a recall – yes, but only when there are no distractions – so, I guess in other words, that would be a no! If there was anything else going on in the area – Bailey wanted to be involved with that and Bob was just white noise! Further adding to Bob’s frustration was that when walking Bailey both on and off of the lead he was trained to walk to heel, but would never look at Bob and spent his time scenting all around or trying to eat anything that crossed his path. Bob was in the midst of teaching Bailey the ’leave it’ command as when off the lead he would eat all sorts of dead things (or herbivorous poop!). Somewhat infuriatingly, he would stay 10 feet away from Bob until he had finished eating and then return looking really sheepish. Bob had been working very hard on his obedience training and had taught Bailey to sit and stay very well and he was often incorporating these in to their daily walks so as to try and vary things a little. He understood many of Bob’s commands, but did look a little fed up when complying and clearly made a choice about what he found most rewarding at the time. They were at the stage that walking Bailey was becoming really frustrating as Bob could not trust him and as a result of that the energetic Labrador was staying on lead a lot of the time. Bob really felt that the family needed help with all of Baileys ‘issues’ and also in being shown how to get Bailey to focus on his handler and perhaps how to have more fun with Bailey and play with him without further compounding the problems. Walks had become absolutely no fun and Bob was the only one who could walk him – the rest of the family simply could not manage him or cope with the embarrassment of constant apology. The idea of a family day out with the dog was not a reality as to let him off the lead would cause too many problems and cast a shadow over what should be a fun day out with the whole family. Aside from their daily life with the dog, Bob was also desperate to be able to start gundog training with him; but he simply could not as Bob felt that Bailey would be too disruptive in a class environment. He had tried on his own many times, but this ended in frustration. During the consultation, Bailey was quite calm in the house and a sweet Labrador who merrily wandered around with a toy in his mouth as I arrived. After listening to all of the issues around the table with Bob, his wife Lucy and their three daugters, Sophie, Ellie and Issy. Bob, Lucy and I set off to the local parks with Bailey. Initially, all went very well. We met lots of dogs and Bailey walked past them on the lead very well, much to Bob and Lucy’s surprise. ‘This doesn’t normally happen’ they commented several times. We then went into an open space and we released Bailey from his lead and attached a long line. Bailey caught a glimpse of another dog in the distance and took off. I picked up the line to call him, but due to his force and excitement, the line snapped and Bailey was off. So was I – to catch him. Catching him fortunately did not prove too difficult, but as his lead was re attached, he was still obsessed – straining over his shoulder to keep the other dogs in sight. I got a couple of my dogs out of the car and did a little training of heel and stay with my dogs in close proximity just to assess the extent of the problem before heading back to the house to explain what I wanted Bob to do to begin to reform Bailey’s behaviour. The crux of the issue is that Bailey had been over-socialised. He had met and played with far too many dogs and met too many horses ‘socially’ – he should have been around horses and around other dogs, but with limited play or interaction. The Labrador is a naturally social and gregarious breed of dog and as such needs way less socialisation and engagement than many other breeds – for example; the shepherding breeds and the guarding breeds need much more interaction with humans to develop normally. The German Shepherd and Border Collie are very sensitive breeds and will require a large amount of social interaction with other dogs. So, having socialised Baily too much, the answer had to be to go back to the beginning. Being around lots of people, lots of dogs and other stimuli without the engagement. Initially on a lead, walking past other dogs, horses, people with no interaction. Baily had been swamped in play and fun and now had to re-learn the rules of interaction. This was set to be a long road with hard work for the Speakman family, but at least they had a goal. The family embarked wholeheartedly on what I had asked them to do, which I always admire, particularly when that is not easy task. I believe there was a shaky start with little immediate progress, but credit to Bob and Lucy – they continued following my advice for a while longer before Bailey became easier to manage and more focussed. I went back to visit the family after a few weeks and discussed the way forwards from there. I felt that now, based on the improvements, was the time for training around other dogs to start to push on Bailey’s Gundog career. Then, I felt that onward improvements would continue endlessly as the training worked hand-in-hand with the daily routines. I invited Bob to bring Bailey to a Working Trials training session; simply to train and to be around other dogs whilst focussing on the handler. That all went swimmingly well (aside possibly from a friend of mine teaching Bailey to play tug in preparation for criminal work!) and so Bob felt confident enough to embark on Gundogs training – commencing with a training day with my colleague, Lez Graham. I was excited (not quite as excited as Bob!) to hear of his first day’s training on the field knowing that he was in the best possible hands. That, I believe was the start of Bailey’s onward life as a Pet Gundog. Now able to work on and off lead in the presence of distractions and I am sure that Bailey will continue to go from strength to strength. With an owner as committed as Bob and a trainer as skilled as Lez…there is no room for Bailey not to succeed! 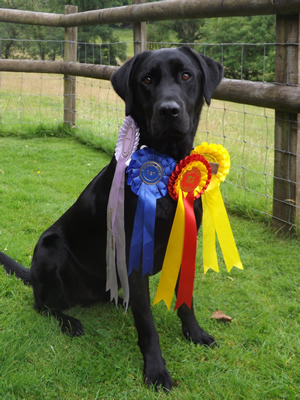 “Bob and his stunning black labrador Bailey came along to my Upping the Ante gundog training day following on from a behaviour consultation with Ross. Bob was apprehensive to say the least as this training day really is about upping the ante with your gundog, including taking the lead off for off-lead heelwork and starting to work your dog at distance. The thought of Bailey sitting 10 feet away and expecting him to do as he was told whilst other dogs were around left Bob feeling a tad on the nervous side. There was absolutely no need to though. Bob and his wife had been very disciplined with themselves and followed Ross’ advice to the T and were consistent with it. Although Bailey was interested in the other dogs he wasn’t overly so he was much more interested in doing what his breeding dictated and that was being focussed on the retrieve. 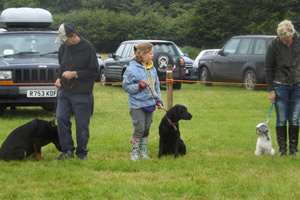 Bob did a fantastic job with introducing Bailey to more advanced gundog work. They both enjoyed it so much that they came back for the next training day Adding Finess which really stretches the dogs by leaving the training field and working in the forest environment, all off lead and with rabbits and muntjac deer too. Bailey has come on in leaps and bounds!